Alan Davie is rarely without a pen or a brush in his hand. This exhibition of drawings provides a glimpse into his large archive of works on paper, demonstrating the importance of drawing to his artistic practice. From early Jungian inspired bodies to recent maps and spirals, this display is a testament to the diversity of Davie's visual forms and his unbounded creativity. Drawing has been a consistent presence in Alan Davie's oeuvre; whether preparatory sketches for paintings or self-contained works, what is evident is Davie's persistent drive to create. The desire to penetrate and excavate inner emotion and sensations in order to uncover a hidden truth has been his life's vocation. Davie's drawings take many forms; he has formulated his own vocabulary of shapes, including diamonds, arrows, and ladders, based upon the Jungian theory of the existence of symbolic archetypes repressed within human psyche. During the 1950s he also developed a method of spontaneous mark marking and of free association. Davie continues to create automatic images seemingly unhampered by conscious thought. Throughout his career, Davie has maintained an unwavering faith in the necessity of art, and although now in his 90s, he remains dedicated to the principle that it can enable transcendental revelation. To celebrate his 90th birthday in 2010, exhibitions of Alan Davie's work took place at Gimpel Fils; The Stanley and Audrey Burton Gallery, University of Leeds; Leeds City Art Gallery; Callendar House, Falkirk; Kings Place Gallery, London; and Northumbria University Gallery, Newcastle. Alan Davie's last major retrospective exhibition was staged at Tate St. Ives in 2003-04. Other exhibitions of his artwork have been held at The Barbican Art Gallery, London (1993); The Scottish National Gallery of Modern Art, Edinburgh (1997); and COBRA Museum, Amstelveen (2001). Over the course of his career Davie has been the recipient of numerous awards and retrospectives. In 1963 he was awarded the prize for Best Foreign Painter at the 7th Sao Paulo Bienal, where the British Council exhibited a solo display of 17 paintings. He was awarded a CBE in 1972 in the Queen's Birthday Honours. His paintings, drawing and prints can be found in numerous international public collections including Tate Collection, London; The Scottish National Gallery of Modern Art, Edinburgh; National Gallery, Oslo; Stedelijk Museum, Amsterdam; the Peggy Guggenheim Collection, Venice; National Museum of Canada, Ottawa; Museum of Modern Art, New York. Until her untimely death in 1997, Andrea Fisher addressed the complicated nature of disaster imagery and the hidden, psychic significance for the viewer. Taking their cues from feminism and psychoanalytic theory, Fisher's work consistently asked difficult questions, including how we understand and negotiate images of traumatic events. Reframing, zooming, and cropping found images of traumatized victims of war, and focusing on scars and scratches, hair and hands, her works disclose intimate truths about violence, for those who are willing to look. Fisher's works have a conceptually severe beauty, combing photographs and industrially fabricated elements. In the series Impossible Relations, closely cropped images of war victims are paired with images and objects of a more personal nature. Held between large sheets of glass the public and private images are caught in a relationship which is essential, yet partial and unstable. Fisher utilized found war photographs to explore the relationship between public images of war victims and the intimate experience of private spaces. Close-cropped framing intensify the images, the proximity of the body in close-up becomes disturbing and our encounter with such images of victimization and suffering touch our own fears. Yet in the equation between the sign and the experience there is a failure. The image of the war victim remains irreducibly other and the seemingly casual method of display, balancing and leaning images distances us from the trauma. Despite her use of inventoried artifacts and dated photographs, precision is paired with ambiguity in Fishers works. She toyed with the conventional understanding of the photograph as providing evidence of something 'having been'. Here images become evidence of unknown traumas; death and violence are amplified by their absence while magnified images are repeated as though to emphasize an event that is unknowable. Original meanings are held in suspension, certainty is disrupted and all that remains is an archaeology of partial fragments. Andrea Fisher (1955-1997) studied sculpture at St. Martin's College of Art and Leeds University. She was the author of Let Us Now Praise Famous Women: Women photographers for the US Government (Methuen, 1987) and curated an exhibition of the same name at the National Museum of Photography. She taught at Goldsmiths College, and exhibited widely, including her two-person show with Mona Hatoum at the South London Gallery in 1993. 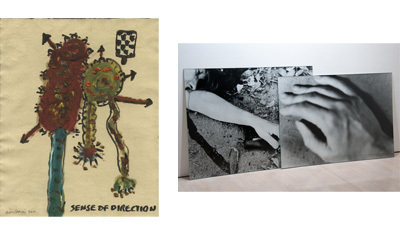 Solo exhibitions were held at Camden Arts Centre 1993, Gimpel Fils, 1992, and Kendal Brewery Art Centre, 1992. Her work was recently included in Never The Same River (Possible Futures, Probable Pasts) curated by Simon Starling at Camden Arts Centre, December 2010 - February 2011.